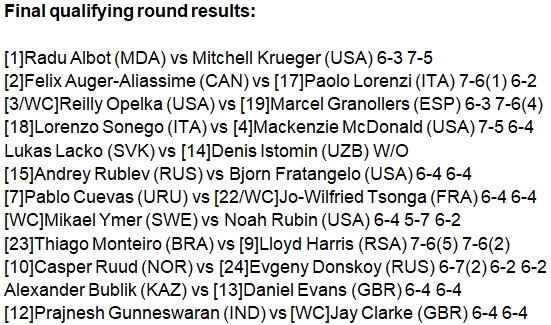 On Wednesday, 12 qualifying matches were completed at Miami Open, making the 96-player main draw finally full. After Indian Wells where he reached the third round as a qualifier, Radu Albot will fight for ATP wins in Miami as well, defeating Mitchell Krueger 6-3, 7-5 in an hour and 32 minutes, serving well and doing enough damage on the return to cross the finish line first. Krueger had an early lead although he couldn't stay at the same pace, losing serve in games four and eight to drop the opener 6-3. Radu sailed through his service games in set number two and scored a break at 5-5 to gain the crucial lead, holding at love in game 12 to seal the deal and move into the main draw. The 2nd seed Felix Auger-Aliassime should have received the main draw wild card but he is there any way after a 7-6, 6-2 triumph over the 17th seed Paolo Lorenzi in an hour and 22 minutes to make the fifth Masters 1000 appearance. Serving at 73%, Felix fired 13 aces and fended off the only break point he faced to keep the pressure on the veteran who dealt with it in the opening set before losing the ground in the rest of the match, suffering two breaks from four opportunities given to the Canadian. Both players served well in the opening set to reach the tie break where Felix grabbed four mini-breaks for a 7-1 after an ace. Carried by this momentum, an 18-year-old landed a forehand winner in the third game of the second set to secure the first break of the match and race into a 4-1 lead with another one in the fifth game. Felix held at 15 at 5-2 to move over the top and book the place in the main draw where he will face another qualifier Casper Ruud. The 3rd seed Reilly Opelka took down Marcel Granollers 6-3, 7-6 in an hour and 23 minutes, hitting 15 aces and saving both break points he had to play against to cross the finish line first, winning four points more than the Spaniard and breaking him once in the first set. The giant server repelled two break points in the third game with winners before breaking Marcel at 4-3 when the veteran netted a backhand. Opelka delivered four service winners in the ninth game to close the opener and, playing with less pressure in set number two. There, both players served well, allowing returners to win just 11 points and entering a tie break where Reilly opened a 5-3 advantage with a forehand winner, firing two winners at 5-4 to move into the main draw. Lorenzo Sonego ousted the 4th seed Mackenzie McDonald 7-5, 6-4 in an hour and 40 minutes, losing serve twice and breaking the American on four occasions to reach the third Masters 1000 main draw, the first outside Rome. The 15th seed Andrey Rublev overpowered Bjorn Fratangelo 6-4, 6-4 in an hour and 40 minutes, erasing all seven break points he faced and converting two out of 11 break chances to play in the main draw of Miami for the fifth straight year, making a debut there at the age of 17 in 2015. Pablo Cuevas beat Jo-Wilfried Tsonga 6-4, 6-4, properly defending his serve and breaking the Frenchman once in each set to leave a former quarter-finalist empty-handed. Mikael Ymer, Casper Ruud, Alexander Bublik are the youngster who advanced into the main draw, together with Prajnesh Gunneswaran who did that for the second Masters 1000 event in a row after Indian Wells.